TUSLA HAS DENIED trying to close down Scouting Ireland “in one fell swoop” with a letter sent to the organisation last month. The letter in question was sent to Scouting Ireland CEO John Lawlor on 18 February and later made public by Children’s Minister Katherine Zappone. It said parents should seek assurances that no overnight scouting trips take place without adequate numbers of trained supervisors. In the letter, the Child and Family Agency also called for an “urgent review” into the manner in which Scouting Ireland manages child protection concerns and disclosures, and questioned the current viability of overnight trips. The letter was sent on foot of an investigation into the alleged sexual abuse of hundreds of children who were members of Scouting Ireland. Most cases date between the 1960s and 1980s, although there may be one from an earlier period. The Irish Times, which first reported the allegations, has said there are over 300 alleged victims and over 200 alleged abusers. In a statement issued about the letter last month, Scouting Ireland said: “It would be helpful to understand what evidence Tusla has for suggesting that ‘Scouting Ireland should consider the viability of continuing with overnight trips. Representatives from Tusla were questioned about the letter’s impact when appearing before the Oireachtas Children’s Committee today. Sherlock said parents and other volunteers who have gone through garda vetting and undertaken training about safeguarding children were deeply hurt by the tone of the letter. He said the correspondence could have possibly led to the “closing down an organisation in one fell swoop”. “It was devastating to the thousands of innocent and decent people who give hours and hours of their time, who dedicate themselves to this lifestyle,” he added. Tusla’s CEO Pat Smyth said the State body never intended for the letter to end up in the public domain. He said the letter ultimately dealt with “identifying practice issues and the need to improve those practice issues”. Tusla’s COO Jim Gibson added that the organisation never set out to attack Scouting Ireland. He said the letter was not a “knee-jerk reaction,” adding that such a reaction “happened elsewhere”. 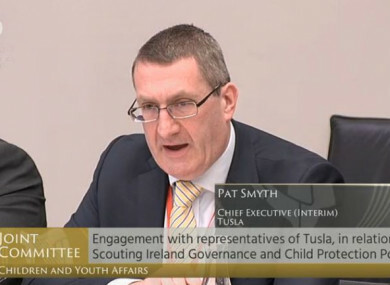 He noted that one of the eight recommendations made by Tusla last month references the need for “an immediate review of the supervision of children” involved in Scouting Ireland. Another recommendation notes that Scouting Ireland “should consider the viability of continuing with overnight trips given the concerns outlined”. Gibson said this review will “look at overnight camping trips and what measures are in place” to protect children as well as any changes that may need to be made. He agreed that there were no issues with the vast majority of volunteers, many of whom are parents. Speaking about the helplines set up to field people’s concerns about the abuse allegations, Tusla’s Service Director Linda Creamer said the initial helpline set up by Scouting Ireland received 43 calls before being disbanded before Christmas due to lack of use. A new helpline set up by Tusla has received 23 calls in recent weeks. Creamer said a review will be carried out into whether it’s “independence enough” for people involved with Scouting Ireland to field such calls. She said there has been “full cooperation” between Tusla and Scouting Ireland in this regard. Representatives from Scouting Ireland are set to appear before the committee later today. Email “Tusla denies trying to close down Scouting Ireland 'in one fell swoop' ”. Feedback on “Tusla denies trying to close down Scouting Ireland 'in one fell swoop' ”.